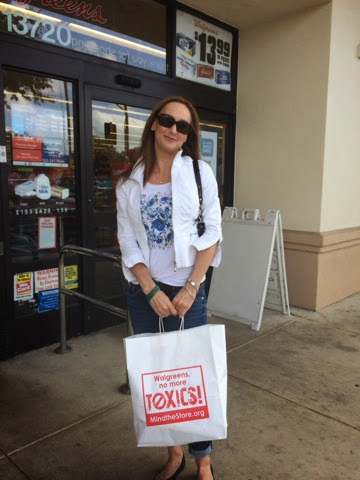 Today was a day of action in over 45 cities throughout the US, including here in Orlando, and thousands of consumers came together to demand Walgreens take action and Mind The Store while we returned products consumers think are safe that sit on their store shelves which are full of cancer causing, hormone disrupting chemicals. 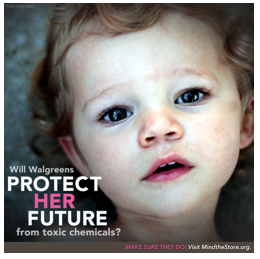 Back in April of 2013 when Safer Chemicals, Healthy Families launched the Mind The Store campaign, we asked the top 10 retailers to join with us and create a healthier future for all by taking action against the unsafe consumer goods on their shelves. Target and Walmart have already taken action and are making great strides in their supply chains to create shelves full of safer products for consumers, but amazingly the largest drugstore that claims to care about health and family, Walgreens, has not responded. Usually when I take part in consumer advocacy and action it is empowering as well as a learning experience. Although today's action was empowering and a learning experience, it was also a reminder of just how important the work that we are all doing - IF YOU HAVEN'T JOINED WITH US YET, YOU CAN DO SO HERE! - actually is. There was a gentleman (okay so he wasn't such a gentleman but...) standing behind me and he yells out to everyone in the store, "Why don't you take your sh@t back home with you and leave all of us alone!" I responded with a calm explanation that there are chemicals in the products on our store shelves that are carcinogens and hormone disruptors and that our children especially need protection. He responded by yelling, "Shut up, nobody cares! You are holding up the line and trying to make us believe what you do." 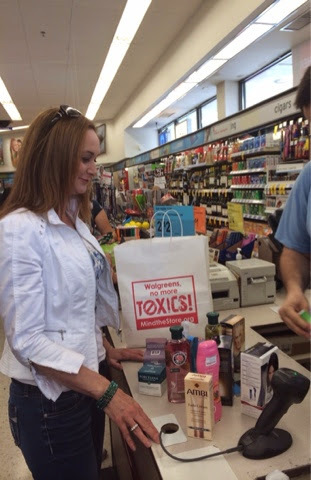 I apologized for holding up the line and asked him if he cared about his health and the health of his family because the products on the shelves in Walgreens and many other stores are full of cancer causing chemicals and it is not me that is saying that but scientists - see more on the science behind the toxic products here. He replied that he just wanted to get his cigarettes and get out of the store. A manager came over and offered to check him out in photo and I could hear him talking about how crazy I was half way across the store. Then on his way out of the store, he yelled over his shoulder that I should watch my back because someone might just come and beat the sh@t out of me. I have never been afraid of much and I am certainly not afraid of a little ignorance on the part of a man who clearly has other priorities than health on his mind. But that ignorance to why we must protect our health and the health of our future generations that I saw today demonstrated in that man, is not going to go away on its own. Well I say we won't stop and we won't leave people behind like that poor guy who simply doesn't know any better. If you are ready to join us and help protect yourself, your family, and the millions of consumers out there that are buying cancer causing, hormone disrupting products from Walgreens' shelves, please go HERE and take one minute to send a letter to Walgreens asking them to Mind The Store NOW!